down to her by her mother, Josephine Lucinda Heskew and grandmother Mary Ann Tronson that the Heskew name was originally spelled Esque and that the family was descended from the French people commonly known as Huguenots. I cannot prove this but there is a fair amount of circumstantial evidence. "Huguenot" was simply a French nickname for Protestant. The Huguenots were savagely persecuted in France and were the victims of the infamous Saint Bartholomews day massacre. An interested party could find a good account of the persecutions in Foxes Book of Martyrs. Huguenots fled France in large numbers and one of their favorite destinations in the late 1600s and throughout the 1700s was South Carolina. I have been able to discover in France the family names Esquieu and Esque. The name Haskew is apparently British in origin but it isnt difficult to see how Esquieu could be Americanized into Haskew, Heskew, etc. In fact the names Esque, Esquew, Eskew, Eskey, Hasque, Haskew and Askew can all be found in the records of South Carolina and/or Georgia during the period 1800-1850. It is entirely possible that some, most, or even all of these names could be connected to a common source. 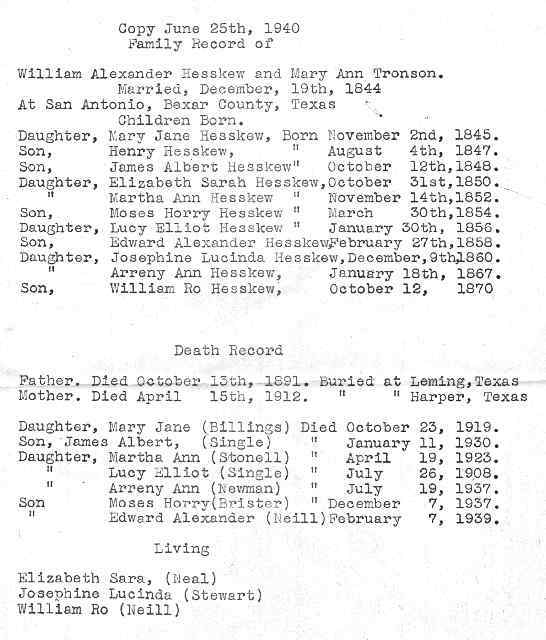 The first mention of the name Heskew that I have found is from a reference to the 1845 will of Moses Heskew in Dallas County, Alabama. Heskew and Hesskew are obviously departures from the original spelling of the family name and it is possible, even probable, that the name has had several shifts or changes through the centuries. Another question is to the state of William Alexander Heskews birth. Some records state South Carolina and others state Alabama. Older brother Moses Heskews records state South Carolina or Georgia. Information passed down through the family has Alabama written down as Williams birthplace. I am convinced that William was born in South Carolina but spent part of his youth in Alabama before coming to Texas. If a Texas census taker asked Where are you from? either South Carolina or Alabama could have served as valid answers. Another interesting tidbit is that William apparently gave his son Moses (Another Moses!) the middle name of Horry. Horry was the last name of one of the most prominent families in South Carolina of French Huguenot descent. Perhaps the Horry family had been friends back in South Carolina or had even come over from France with Williams ancestors. It is also very possible that Horry may have been the maiden name of Williams mother or grandmother or the last name of a favorite uncle. It was very common in the 19th century to assign middle names after this manner. Marvin Schubert (another descendant of William A. Hesskew) has a story related by one Dewey Hesskew which suggests the family was of Scottish origin. In a letter written by Albert Stonell (husband of Martha Heskew, a daughter of William) he states that William was a native of Germany. Unfortunately this letter also contains a glaring error when Albert states that William Heskew and Mary Ann Tronson were married in France. According to a record obtained from the Bexar County (Texas) Archives they were issued a marriage license on December 13,1844 and were married in the county on that same day. These facts certainly call into question Albert's grasp of events. either validate or discount our prevailing assumptions.